GenRight is on the podium at the toughest single day race in the world (King of the Hammers, aka: KOH). Ultra4 is growing its racers and fans for over 11 years now. 50,000 onsite spectators for KOH alone. 404 media accredited sources to cover KOH race week. Live feed from remote desert race course to over 4M viewers. Lots more faithful fans worldwide. Featured in Television coverage, 12 episodes on NBC Sports Network in 2017. Featured in Commercials watched by 4M on Live online feed during races. 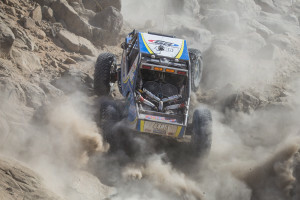 Featured in race footage on Ultra4 and King of the Hammers (and others) social media. Professionally wrapped RV and vehicles with your logo’s on them. Brightly colored and matching team apparel for that professional appearance. Prime placement in race pits and at events. Jordan easily wins Fallon 250 race. Jordan runs another 250 miles to qualify for the 2018 KOH race. Jordan won the Holley LSfest in Vegas. Jordan won the Stampede race. Jordan should be the Series Points Champion (projected for 2017). Over $1M in assets in place (vehicles, trailers, spares, etc.). 3 cars are driven by Father and his 2 sons. Professional image and well spoken. Well respected by other racers and sanctioning body. Featured as a spokesperson for other companies in the industry. We are active and visible at off road events across the country. This activity produces a constant flow of new pictures and videos. 2 full time people to manage Social Media and Forums. Content is available to be used by our marketing partners & sponsors. Can produce and edit product endorsement videos. Can supply photos of products installed and in use. Available to be at sponsor events or trade shows. · Jami’s UTV race was on Wednesday and was going well when at mile 100 of 116 a rear suspension bolt came out and broke the rear shock and axle shaft taking them out of the race. · Jordan’s race was on Thursday and he drove like a champ! At age 17 he piloted his new MOD Class car to take 2nd place only 45 seconds behind the winner. Very close! · My 4400 Class race was on Friday. We started 94th off the line and by mile 90 had passed 80 other racers! My crew chief radio’d us to let us know we were running at the same pace as the leader and with time adjustment we would be in 1st. The car was running good and we knew we could continue at the pace we set until the finish. When at mile 98 of 178 we experienced a catastrophic failure that would result in a high speed tumble 6 times bringing our day to an end. I broke my wrist and hurt my knee, but feel lucky to be alive!